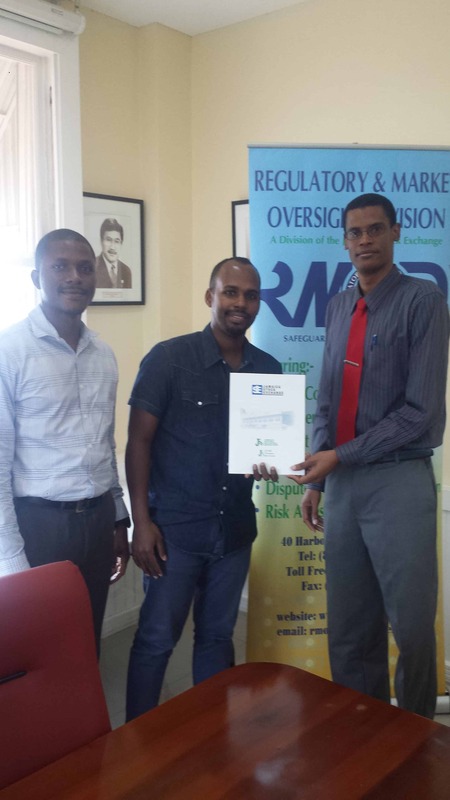 Market Surveillance and Compliance Officers, Mr. Reynard Whyte (left)and Mr. Richard Grizzle (right), presents a Member-Dealer Orientation Package to Stocks and Securities Limited’s (SSL) newly appointed Deputy Chief Financial Officer, Mr. Bernard Mereigh (center) . The occasion was an Orientation Session to sensitize Mr. Mereigh of the Member-Dealer filing requirements to the Jamaica Stock Exchange (JSE). The session was held on Friday October 20, 2017 at the JSE.